To no surprise, if you ask most men, they will tell you that they would like to put on more muscle mass. In our current society, the image of a strong muscly physique is the epitome of what defines a masculine male. It represents power, leadership, health as well as discipline and motivation. For some men, this process of laying down a solid chest, capped shoulders and bulging biceps comes all to easy. While for others, even just putting on a pound of extra muscle mass can be more than a struggle. Building lean muscle requires a combination of the correct nutrition and the correct workout regime. 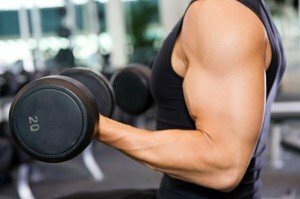 In this article, we will explain the best workout program for building muscle. Unfortunately there are rules for getting ripped and adding muscle. These include training hard and training regularly. Follow this simple rule and you can add some serious muscle in due time. If you’re a beginner exerciser you should start with a simple program that focuses on introducing your body to weight training. All new beginners will experience Delayed Onset of Muscle Soreness (DOMS), a common side effect of commencing a weight training program. DOMS is that soreness you get in your muscle the next day after a workout. In newbies, this can hang around for a couple of days, particularly if you are not accustomed to do any physical exercise or work. With time, this will subside and your body will settle into the weight training. Start with a simple weight training regime of 4-5 exercises, completed for 10-12 repetitions for 2-3 sets. Focus on completing the exercises with good form and with a slow and controlled movement. To do this, you may need to start with lighter weights then your ego would like. Avoid going for the heavy weights straight up, this will compromise your technique and promote uncontrolled jerky movements that increase your risk of sustaining an injury. After 6 to 8 weeks, you should be progressing with your the load of the weights. Ensure you change up your routine every 6 to 8 weeks as well. Change the exercises to target the same muscle groups but in a different way. Ideally, you should aim to train 3 to 4 times per week, with ample rest in between each training day so that your body has a good opportunity to recover and repair before your next training day. It is during the recovery and repair stage that your body begins to build more muscle mass. This is why rest days are so important. You may have heard of split regimes. These entail splitting up your workouts into different body parts or muscle groups. For example, a common split is to train your upper body on one day and your lower body on another. Splitting your workouts allows you to train one body part or muscle group hard and then rest those muscles the following day whilst you train another group of muscles. This is particularly important if you plan to train more frequent as training the same muscle groups repeatedly for several days in a row, slowly compromises your ability to train those muscles effectively and leaves insufficient time for recover and repair. By following these simple training principles, you can easily build the muscled physique you’ve always desired.